Modern, intuitive and easy-to-use dashboards are upgrading the Microsoft Dynamics AX data management and analytics processes for Manufacturing and Distribution businesses. Dashboards are really building some momentum as leading Business Intelligence (BI) tools. Dashboards, or data visualizations, are seemingly everywhere, but especially in the BI sector. This is likely due to their popularity as an investment for executives, with their quickly accessible and digestible data visuals. Dashboards provide easy analytics for fast-paced organizational decision-making. More specifically, dashboards are charts, graphs, and scorecards that showcase data trends, strengths and weakness via key performance indicators (KPIs), whether for projects, departments, and/or the entire organization. 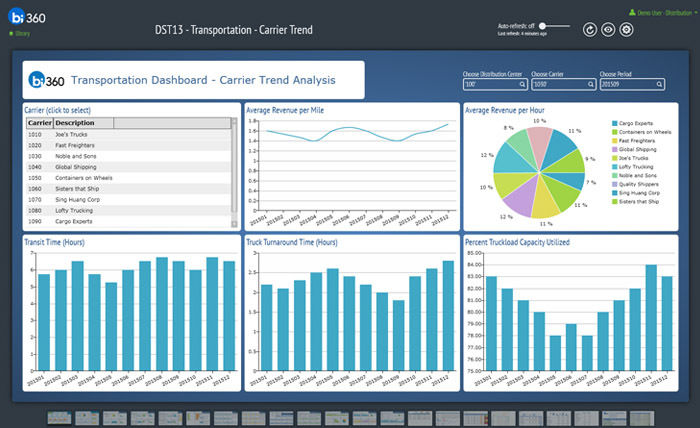 Similar to dashboards you rely on in any vehicle, corporations can make important decisions by reviewing or monitoring operational and transactional data trends in a BI dashboard. The main difference between everyday dashboards and BI data visualizations is that BI tools allow for interaction and interpretation, for deeper analyses and any required adjustments. Additionally, a BI dashboard has built-in drill-to and drill-down capabilities, so you can choose how to best move forward utilizing your Microsoft Dynamics AX data for your manufacturing and/or distribution organization. Okay, you get it: dashboards are prevalent in today’s business culture. Let’s talk about the solution specifically for manufacturing and distribution companies depending on Dynamics AX. A great place to start the discussion would be how you can integrate your data. Modern dashboard solutions can pull company data from multiple sources. You can yield real-time analyses by integrating directly from Dynamics AX and/or Manufacturing Execution Systems (MES), as well as other data sources. Dashboards that are integrated live are just what professionals who require up-to-the-minute data need, as well as smaller companies that only need the simpler Dynamics AX dashboards, without resources to maintain a BI database, like a data warehouse or an online analytical processing (OLAP) cube. Alternatively, bigger organizations usually need a more stable integration, which a BI data store can provide for analytical tasks. Opting for a data warehouse or an OLAP cube to integrate your information empowers larger companies to produce data visualizations without making the AX server sluggish (or other data source system servers) because data pulls can be too large or just simultaneous. A BI data store is an additional investment, and you’ll have to configure and monitor data replications to the cube or warehouse, but your data queries won’t slow down the server. Even better, some dashboard solutions provide the option to integrate live when you have pressing deadlines, requiring real-time data like customer order logs for decision-making – AND pulling data from a BI data store for more routine data visualizations, like staffing and employment. Flexibility in the form of hybridity is exactly what today’s businesses need – and it doesn’t have to break the bank. But you should also be weighing your platforms options. To continue learning more about dashboards for Manufacturing and Distribution companies with Microsoft Dynamics AX, read the rest of this article here. The post Dynamics AX Dashboards for Manufacturing and Distribution appeared first on ERP Software Blog.